The origin of blacksmithing, the forming of hot metal between hammer and anvil, goes back thousands of years. Without the knowledge to forge hot metal we would still be in Stone Age. Without the skill of blacksmiths there wouldn't be any knives or modern tools. There wouldn't be any cars or trains, or any industrial production to speak of. And this is just the practical side of it. Blacksmiths of the old times produced a lot of fine art too. 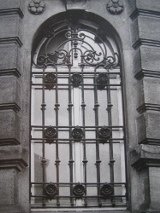 Elaborate rails, gates and other metal art work decorate most of Europe's old cathedrals, castles, and many residences. Nowadays most forging is done by machines. No blacksmith has to forge a ship's anchor by hand anymore. 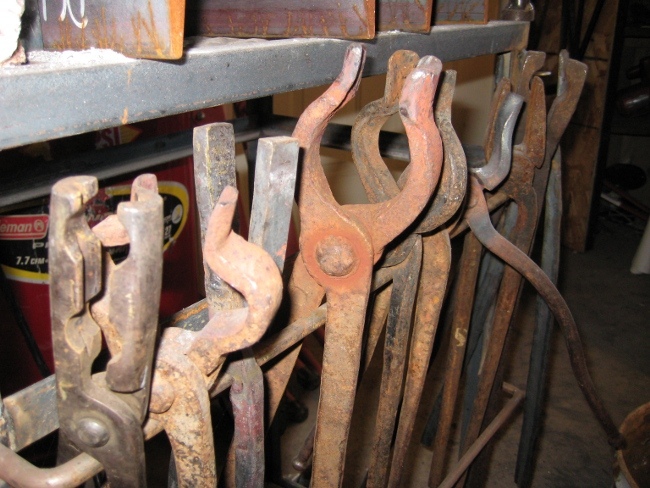 Hardly any farrier builds horse shoes from scratch. With machines being more accurate and efficient the art of blacksmithing almost got lost. When ABANA, The Artist Blacksmith Association of North America, was founded in 1975 it had no more than 40 members. This amounts to about one blacksmith per seven million Americans. Fortunately things have changed since then. More and more people are willing and able to pay for the luxury of hand crafted metal art. 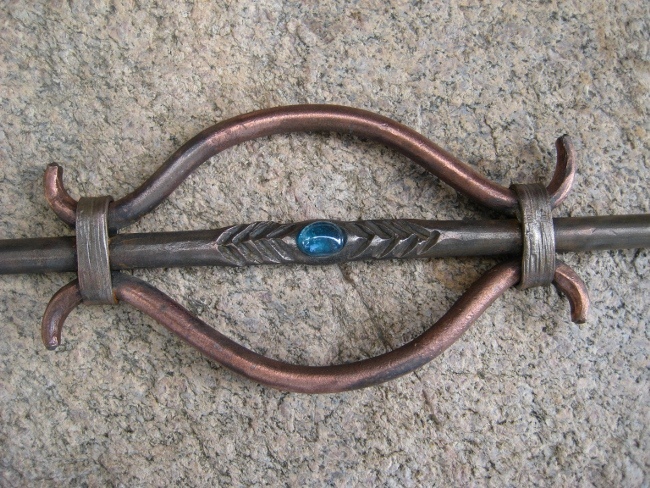 This led to a rejuvenation of Blacksmithing as well as other fine arts. Blacksmithing is what a blacksmith does. That is: Heating metal to a glowing red or yellow and then forming it between hammer and anvil (and getting all black from the smoke of his coal fire). 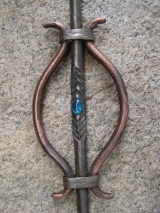 Sometimes blacksmithing is also called forging. Iron is heated to a temperature where it becomes malleable. Then it is forged into the shape that the artist sees in front of his inner eye. Blacksmithing and forging are words that mean the same thing. The product of a blacksmith's work is called forged or wrought iron. 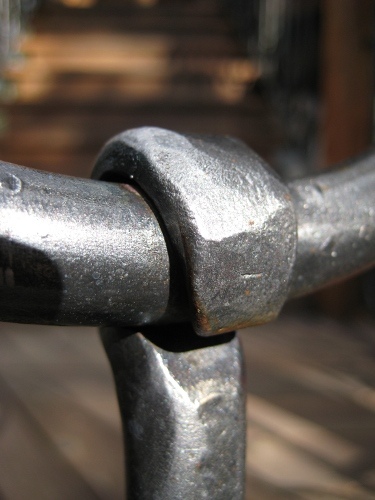 This term wrought goes back to an iron alloy called Wrought Iron that was used before about 1920. 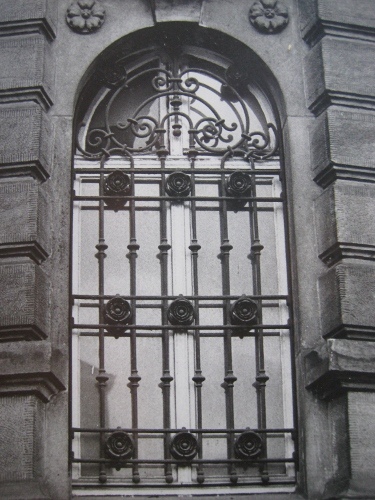 Wrought Iron was used by blacksmiths because it was especially malleable when hot. The products made out of it were very corrosion resistant even in sea water. Today most iron forging is done with Mild Steel which is readily available in many shapes and sizes. 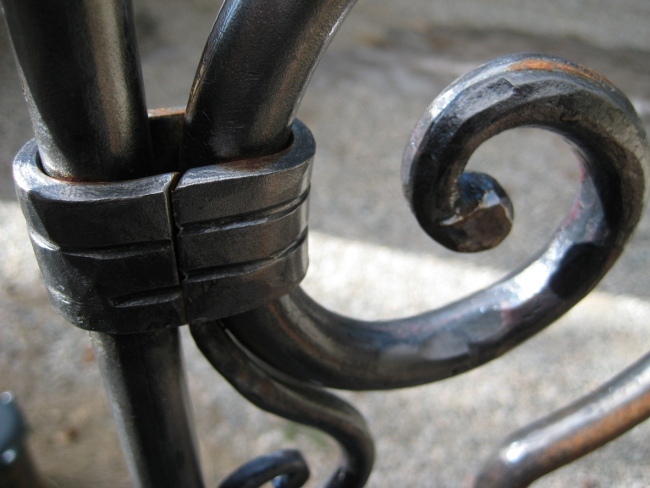 However, real Wrought Iron is having a comeback because it has a very unique and pretty grain and surface texture. Blacksmiths in the old days did not have any electric tools like welders or grinders. Electric welding actually hadn't been invented until World War II. Until then steel parts had to be riveted or banded together to form larger structures. Many old bridges still show rivets that connect the beams. Another traditional form of joining metal is forge welding. Here the parts to be connected are heated to almost melting. As soon as the surfaces get sticky they are hammered together. 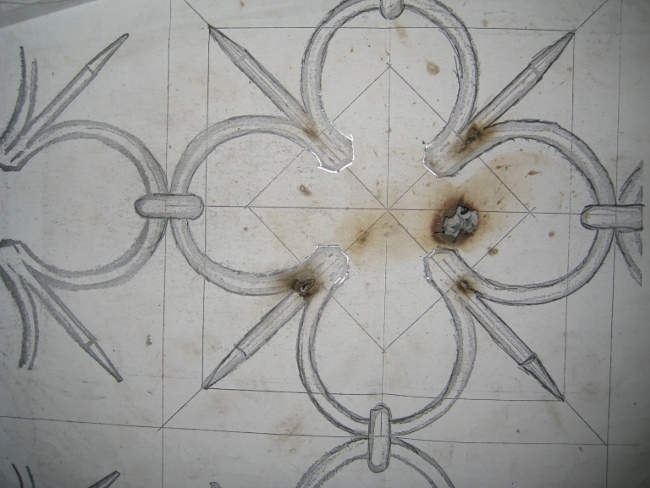 This is a traditional technique that only experienced blacksmiths are able to master. 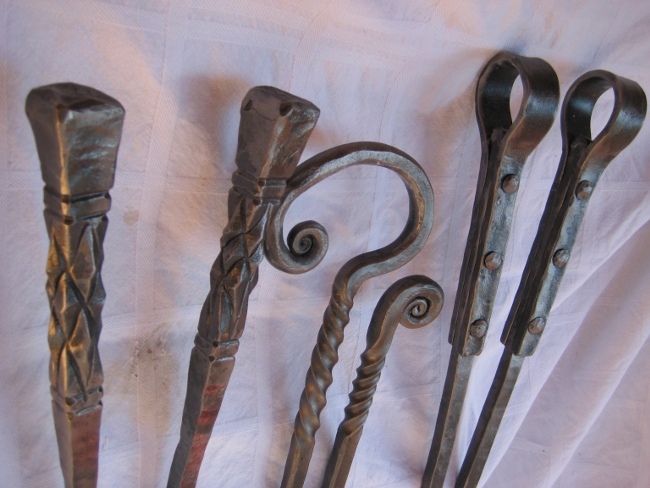 It is the old joining techniques, riveting, banding and forge welding, together with the hammer marks on the surfaces that make real forged iron unique. 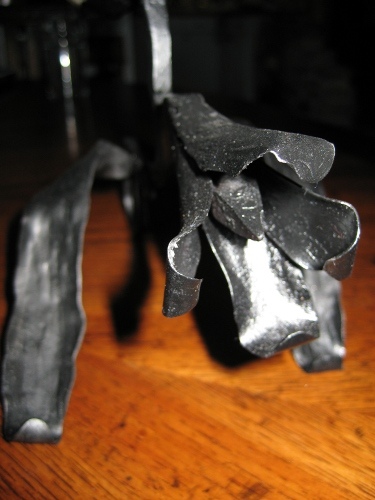 This limitation makes blacksmithing to an art. All it takes is metal, fire, water and wind (the later two to cool the iron and to blow the coals to a good heat). And of course it takes the inspiration of the artist blacksmith. Nice ironwork can be created using modern tools too. Joining steel parts with modern welding technology is called fabricating. Fabricating opens up a variety of forms and shapes hardly achievable with traditional methods. Fabricated art and sculpture usually have a more contemporary look. The typical application of fabrication however is not art. Fabrication methods are used to mass produce metal products and make them more affordable. An iron banister for instance can be welded together using ornaments and pickets that have been made in hydraulic presses. But the resulting products are not comparable to traditionally crafted wrought iron. They don't have the same personality and character. They don't have the harmonic flow nor the nature inspired forms. Almost all metals can be forged. At Wood & Iron Works we work mostly with Iron, Copper, and Bronze. 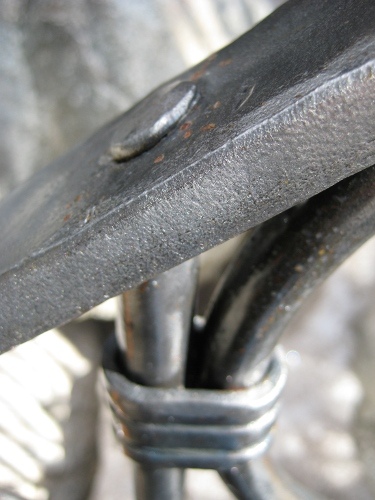 Iron (mild steel) is the material used most commonly. Copper and brass give nice accents to iron, for instance as collars or leaves. It is seldom used on its own. Bronze is a most precious choice. It develops a beautiful patina and is almost indestructible by wind and weather. This aura of elegance and preciousness however comes at a price. Not only is the material very expensive. It also takes more skill to be forged. An additional metal that came into fashion in recent years for more contemporary art pieces is stainless steel. Our Indian Chief sculptures have been forged from stainless steel. Look them up in the Gallery. Iron will rust over time. This oxidation process is faster outside than inside, and faster in humid than in dry climates. In Montana's dry air this is of no concern, except if one doesn't like the rusty look. We usually polish our work pieces to a metallic sheen and then seal it with a clear coat. Interior wrought iron can also be sealed with bees wax or various oils instead of modern lacquer coatings. The black of old forged iron was achieved by applying beeswax to the hot iron. This gives a nice satin black finish. Using linseed oil the black tends towards blue, a form of gun blueing. Copper is stable even outside. It will get brown and than black in months to a year and green after decades. If the typical reddish copper color is preferred it can be polished and clear coated. Although, the polished appearance will not last forever. Bronze typically is just polished and left alone to withstand the elements. It will develop a unique greenish patina that everybody knows from the statues that adorn old city's gardens and squares.